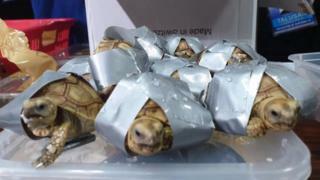 Philippine police have seized more than 1,500 live turtles and tortoises found wrapped in duct tape at Manila airport. The reptiles, found in four unclaimed pieces of luggage, could have sold for more than 4.5 million pesos (£60,000; $86,631). Police believe the bags were abandoned after the carrier found out about the harsh penalties for illegal wildlife trafficking. If caught, they could face two years in jail and a fine of up to 200,000 pesos. A total of 1,529 turtles and tortoises of different species were found in four pieces of unclaimed luggage in the arrivals area of Ninoy Aquino International Airport on Sunday. Some of the animals were of the Sulcata Tortoise species - which are recognised as vulnerable on the IUCN's Red list of Threatened species. The Red-eared Slider turtle was also among the reptiles found. The Bureau of Customs said the reptiles were left behind by a Filipino passenger who was onboard a Philippine Airlines flight from Hong Kong. It said the passenger could have abandoned the luggage after they were "informed of the vigilance... against illegal wildlife trade and its penalties". The animals have now been handed over to the Wildlife Traffic Monitoring Unit. Turtles and tortoises are often kept as exotic pets, but are sometimes also used as a form of traditional medicine or served as a delicacy across parts of Asia. Their meat is considered by some to be an aphrodisiac, while the bones are powdered for use in medicine. Tortoises are land animals while turtles can be aquatic or terrestrial. Last week, 3,300 pig-nosed turtles were smuggled into Malaysia by boat - though this attempt was intercepted by Malaysia's maritime agency.